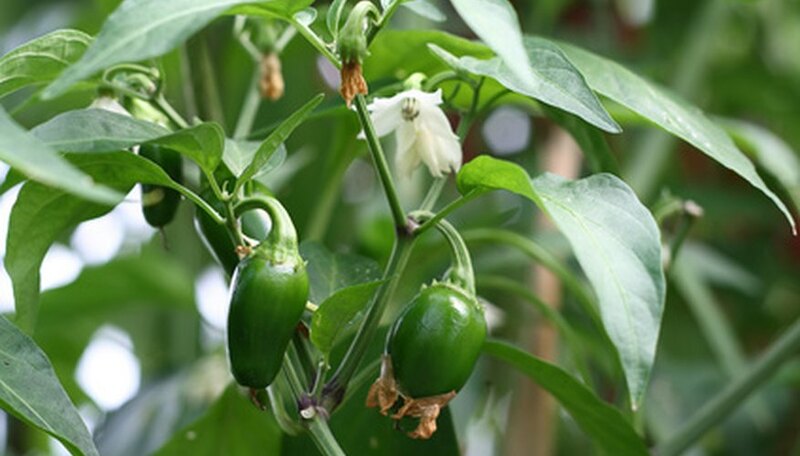 Green peppers are semi-tropical plants, grown as annuals in the United States. They produce either sweet peppers, used fresh in salads or cooking, or hot peppers that add a zing to salsas and Mexican dishes. Peppers have growing needs similar to tomatoes. They like warmth and moisture. Unlike tomatoes, though, they don't require any staking. Hundreds of varieties of pepper plants exist. Green bell peppers produce sweet, thick-walled bulbous peppers that are used in salads or in many cooked dishes, including omelets, stuffed peppers and sloppy Joes. Hot green peppers, including jalapeno, anaheim and serrano peppers are generally roasted and added to cooked dishes or salsas. Hot peppers are thin-walled and need less moisture than bell peppers. They grow well in the dry climates of the western United States. Peppers are somewhat persnickety about their growing conditions. Because they are native to Central and South America, they love warm, moist conditions. They perform best when daytime temperatures are consistently above 75 degrees Fahrenheit. Cold temperatures and dry conditions are the most likely causes of leaf-dropping on peppers. Aphids can slow growth and spread mosaic disease, but the leaves aren't likely to drop. Other problems such as bacterial leaf spot or calcium deficiencies may cause spots on leaves or blemished fruit. Gardeners often plant peppers too early in the spring, before temperatures are reliably above 65 degrees Fahrenheit. Waiting at least two weeks after the last expected frost before planting will ensure that the soil is warm enough. Using row covers or black plastic mulch also keeps peppers warm. Irrigating pepper plants as needed to keep the soil evenly moist also prevents leaf drop. Peppers need constant moisture and will exhibit signs of stress, including leaf drop, if they are allowed to dry out and then are watered heavily. Peppers grow unpredictably in northern climates. Fast-maturing varieties are more likely to be successful in these areas. Additionally, if the weather is too hot or too cold, flowers will drop and not produce fruit. Unfortunately, the only solution for this problem is to wait for the weather to change.